Takeru Kobayashi, perhaps the best competitive eater of all time, has announced he will compete for the first time in Wing Bowl history. Kobayashi was the winner of the famous Nathan’s Hot Dog Eating Contest an unprecedented six years in a row from 2001-2006 and appeared at Wing Bowl 19, eating a cheese steak in world record time. Wing Bowl 20 is Friday, February 3 at Wells Fargo Center. 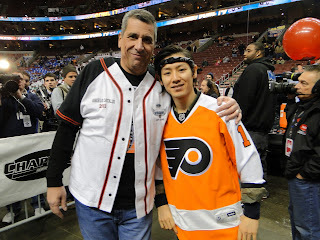 Kobayashi is amazing man , I like his compititions of eating.Now a days he is in he is ready to participate in Philadelphia on February 3rd competing in his first Wing Bowl. Last year, he devoured a cheesesteak in less than 25 seconds.Really amazing man.